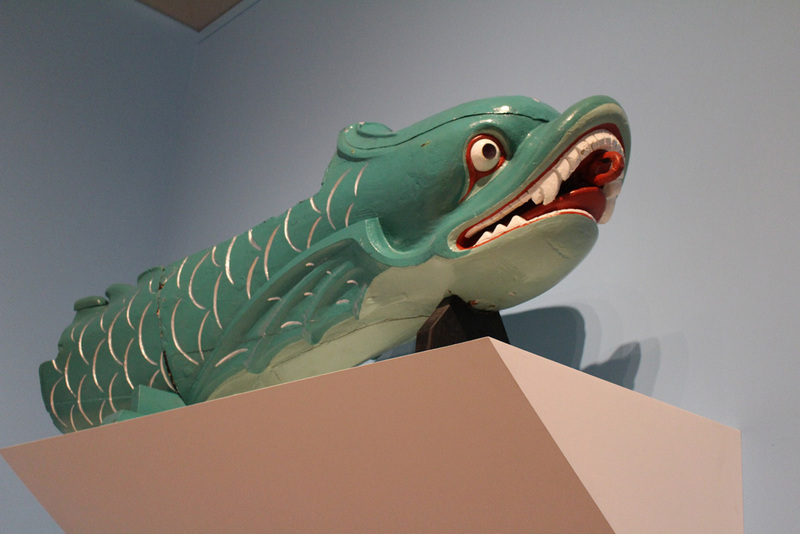 One more interesting China Rhyming like object from the Tate’s British Folk Art exhibition – the Salamis Serpent Figurehead from 1863. The Salamis Serpent was the figurehead for the wood paddle 2-gun despatch vessel HMS Salamis, launched at Chatham (Kent) in 1863 and broken up at Sheerness in 1883. The figurehead was saved and restored. The Salamis figurehead was suitable as the ship was designed for eastern waters and almost immediately despatched for China coast duty under Commander Francis Grant Suttie in 1866. Suttie sailed largely in China waters and eventually moved on to sail Navy ships mostly in the Pacific and down to Australia. There is actually a dedication to Suttie in the stained glass at St. Andrews Blackadder Church, St. Andrews Street, North Berwick (see here). My great grandfather sailed on this ship and would really appreciate it if I could use the images. Of course I will provide full credit to your site. Would that be possible please. My great grandfather was on HMS Salamis from 13/2/1873 21/5/74 . Can you tell me were the ship was on operation. The photo on your page appears to be the iron-hulled wool clipper Salamis of 1875. Although built as a three masted full-rigged ship, your photo appears to show here late in her career (she was wrecked in 1905) and rigged as a barque.